Pretty sure Duke Togo never misplaces his swagger. If you’re thinking, “Why does Golgo 13 sound so familiar…” perhaps it’s because you’ve played the NES game? Or its sequel The Mafat Conspiracy? Or you’ve read the manga, seen the anime, bathed with “Golgo-13” brand bubble bath? Stop me if I guess it. And I hope I have ’cause I’m not putting up any more links. For those who have no idea what a Golgo is and why there’s thirteen of them, permit me to expound. Since 1968, creator Taiko Saito has chronicled the misadventures of a professional assassin named Duke Togo a.k.a. “Golgo-13.” Duke is dark, mysterious, loves women, and is an unbelievable shot with an M16 sniper rifle. Like James Bond or Sherlock Holmes, Duke always gets the job done, but the appeal lies in how he completes the task. Like Mr. Bond and Mr. Holmes, Duke remains incredibly popular to this day: “Golgo 13” is one of the longest-running, biggest-selling manga series ever in Japan; over 200 million volumes sold and counting. Personally, I would love to dive into Duke’s world, but aside from a few officially translated volumes and anime series of varying quality, there’s little to find of “Golgo 13” in the States. Given America’s current penchant for anti-heroes and manga, Duke’s well-groomed death displays seem like they’d be a perfect fit for our troubled landscape. As of 2014, however, no English publisher/content creator has given the series the time and treatment it deserves. But hey, at least America got the NES games, right? Well… The Mafat Conspiracy anyway. If only every SG-1000 title was this visually appealing. Golgo 13 for the SG-1000 begins with Duke leaning out of a car with his sniper rifle. The car is driving on a paved road alongside two parallel train tracks and another parallel paved road. 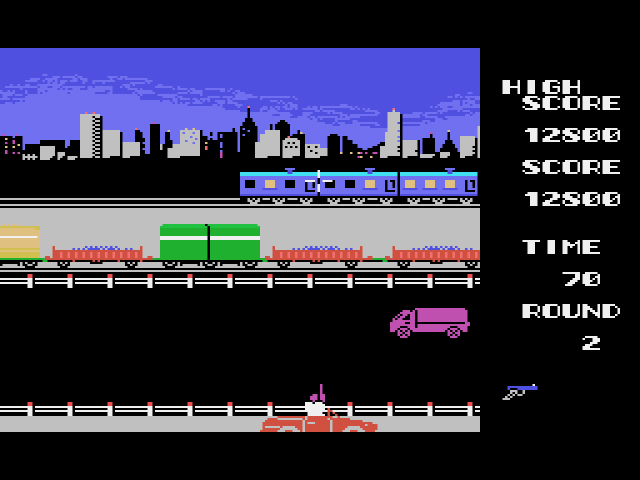 The train in the background contains an array of lighted windows that Duke must shoot in order to complete the level (and release hostages?? ), while the train in the foreground contains boxcars that, if shot, will propel Duke’s bullets backwards towards him. Both trains are constantly moving at different speeds, so lining up your shot can be tough. The best way to shoot the lighted windows is to line up Duke’s cursor with the windows and leave it there. Even if boxcars or other vehicles pass in front of your aim, if you don’t move the cursor, it will still be where you left it once the boxcars move on. If Duke gets hit by his own bullet, you lose a life. If the time limit runs out, you lose a life. 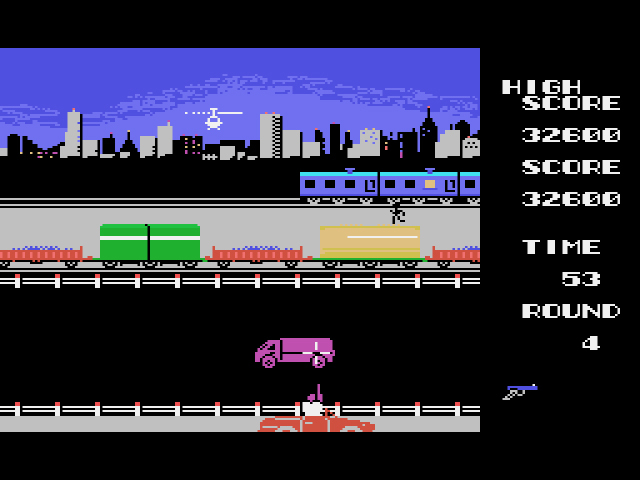 Level 2 brings in trucks that drive on the dirt road in front of the foreground train at varying times, further blocking your bullets, while Level 3 has a helicopter that drops bombs on you. Once you reach Level 5, the levels repeat, but the stress-filled gameplay never lets up. Duke really hates pink trucks. A Golgo 13 game must have been a huge win for Sega. Not only was it the first video game ever based on the manga, but it was Sega’s first licensed title for the SG-1000. 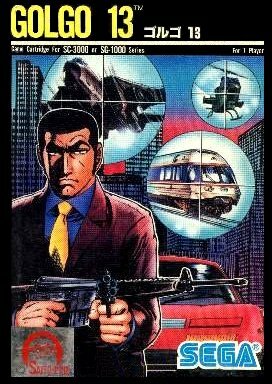 Given that information, one might assume that Sega would go all out and make Golgo 13 the premiere title for the console. But Golgo 13 isn’t so much fun, as it is an anxiety-inducing technical achievement. The top-notch scrolling effects and lack of slowdown give the game an action-movie feel, but the more elements added to a level, the harder it becomes to concentrate on your relatively simple task. After a few levels of overwhelming aim-drive-shoot gameplay, I was ready to take a breath and tackle another aspect of Duke Togo’s world. Alas, aim, drive, and shoot is all the game has to offer. While Golgo 13 is certainly a showcase for what the SG-1000 can do, I’d be surprised if the finished product completely fulfilled fans’ expectations. FUN FACT: I’m pretty sure the name “Golgo 13” is a reference to Golgotha, the hill where Jesus Christ was crucified. The place would be pronounced “gorugosa” in Japanese, and “Golgo 13” is “gorugo sachiin” — which would explain the use of a skeleton wearing a crown of thorns as the series’ logo. Yes, Golgo 13’s logo is an undead Jesus Christ. It is the most heavy metal of all anime. Indeed Golgo is a reference to Golgotha and “13” is a reference to the number of people at the Last Supper. The Japanese are fascinated with Christian characters and themes, yet they have one of the lowest Christian populations in the world. Something like .6%? Very interesting. Japan and Christianity have a very interesting past. Like the Shimabara rebellion and the secret underground Christians. I sometimes think they apply mysticism to Christian culture like we might to Druids or something. Anyway I had heard of this game before but never knew much about it. Not surpising Jeremy Parish would chime in because it was probrably from one of his articles on Golgo 13 games that I knew about this game. My knowledge of the property pretty much stems from The Castle of Caligostro, the Miyazaki movie of Golgo 13. And of course the Videogames. It looks interesting enough gameplay wise. I would almost say a sign of a good sniper game is that it is nerve wracking, like Sniper Scope in the arcade. Like most of the games you’ve covered, it’s hard to say how it met fan expectations, as Videogame of the day were mostly simple affairs. Certainly on par with what was in the US in 1984. But it makes you realize how much the NES must have looked so much better in comparison at the time. By the time you get to later SG-1000 games, and especially Mark 3 games, the games will certainly become more involving. @sean697: The Castle of Caligostro is a Lupin III movie. The characters are *very* different. See, that’s how ignorant I am of the franchise that I confused Lupin III and Golgo 13. I would feel really embarassed, but ehhh it’s 80’s anime. Like Sherlock Holmes, he always gets the job done… unless he’s up against women named Irene, that is. …sorry, I’m a SH fan. At any rate, another good review, although I probably would have given it a B- rather than a C. The fact that it does add new obstacles in each new stage and is aesthetically pleasing, as well as having a decent level of difficulty (while it lasts) puts it above the other “C-Level” SG-1000 games, at least for me. Also, did you notice that when you beat Stage 6 the stage number doesn’t increase? It just stays stage 6… forever… Like a slightly-less-than-8-bit version of Groundhog Day. Made it to Stage 5 before I thought I was gonna have a panic attack. Every element of the game is solid, but I didn’t like how stressed it made me. Can’t recall the last time a game made me feel this way.